Audi has long worn the crown as king of the revered Le Mans 24-Hour race but Nissan thinks it can knock the German marque off its sparkly throne with this, the 1250bhp GT-R LM Nismo. Yes, it's ruddy ugly but that's partly because the bulbous machine shuns the typical mid-mounted engine, rear-wheel-drive layout of other Le Mans entrants and instead favours stuffing its 550bhp 3.0-litre twin turbo V6 under the bonnet. That's not to say the rear axle is left unloved, as that's given a massive 700bhp electric boost from some battery-powered motors and cutting-edge lithium-ion battery technology. To cope with the strains placed upon the electric motors during a 24-hour race, the electric drive system uses a Kinetic Energy Recovery System (KERS) to return some of the energy harnessed under braking back into the battery packs. Unlike Nissan's mad Deltawing and Zeod creations, which tried but unfortunately failed to beat the crowd of Toyotas and Audis during the 2012 and 2014 Le Mans races, the GT-R LM Nismo will compete in the LMP 1 class rather than the 'Garage 56' experimental category. 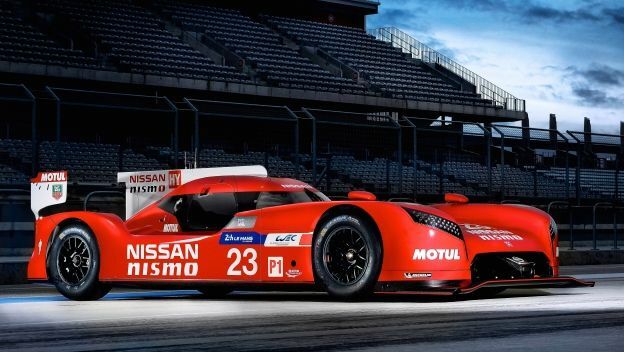 That means it needs to perform but Nissan is confident it can walk away victorious. "Our record at Le Mans is third place overall so we have unfinished business there," Shoichi Miyatani, President of Nismo said at the car's unveiling. "We want to win and we have the knowledge to do that – for our customers, our employees and our fans. The competition is exceptionally strong and we are excited by the challenge,” he added. The first World Endurance Championship race will be at Silverstone on April 12, so tune in to see if it works or not.